It is quite literally the battle of the phones right now (well between Nokia and Sony Ericsson anyway) as each manufacturer elbow drops the opposition in a bid to become the mobile phone maker to produce the most mobile phones in a year (there must be some kind of insider wager going on). 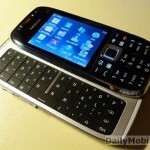 Nokia has just launched the loooong-awaited 5800 XpressMusic, the N97 is March bound, there’s the newest edition to the XpressMusic family, the 5730 and there’s the environmentally friendly N79 Eco. As if that wasn’t enough, a new Nokia handset has just rolled into town to join its ever growing Nokia brethren. Nokia seems to have taken a leaf out of Sony Ericsson’s book, as the E75 looks remarkably similar to the recently announced 5730 smartphone. But they are different. Yes, both are sliders with a hidden QWERTY keyboard, but the main difference is value. While the E75 is going to thrown in the direction of business or high-end users, the 5730 is more of a budget QWERTY slider, i.e. affordable and more music and text centric. Specs-wise, we’re looking at a 2.4-inch screen, HSDPA, WiFi, Bluetooth and a 3.2 megapixel camera. It’s expected to make an appearance at Mobile World Congress next month. And that’s about as much as we know thus far.